When you think of Hyundai, what words come to mind? Hyundai has evolved as a brand known for reliability, comfort, and value, so one of the last words that might spring to mind is "speed." If that's the case, then this might surprise you: the 2013 Hyundai Genesis R-Spec is one of the fastest cars you can get for less than $50,000, even among other rear-wheel-drive sports coupes. That's right. The Hyundai Genesis Coupe is faster than the Mazda Miata, the Scion FR-S, and the Subaru BRZ. The Genesis R-Spec is outfitted with a beastly 3.8 litre direct-injected V6 that puts out 348 horsepower. Track tested, the Genesis coupe can hit 100 kph in just over 5.2 seconds from a standstill, finishing a 13.8-second lap at 167 kph. Among cars in the same category, that's a spirited performance. Track stats are nice, but not necessarily applicable to daily driving around Ottawa, St. Laurent, and Gatineau. Stoplights, traffic laws, and other drivers would prevent you from getting the most out of your Genesis Coupe R-Spec. But what if that weren't the case? What if you could floor it from start to destination in an empty Gatineau? How fast could you get to your destination? Let's pretend there are no limits, that it's just you and your sports coupe. Surgenor Hyundai crunched some numbers to see just how quickly a Hyundai Genesis Coupe could speed from our dealership to different locations around St. Laurent, Gatineau, and Ottawa. For the sake of keeping calculations somewhat simple, we'll keep a couple of things constant. This is, after all, theoretical. First, let's say the Genesis Coupe is on cruise control at 100 kph. We'll assume it always takes about 5.2 seconds to reach that speed, at which point we maintain a steady 100 kph. As part of our constant acceleration, we have to assume a set distance travelled in reaching that speed. In this case, the Genesis Coupe will have travelled 692 meters at 5.2 seconds. Finally, a disclaimer: Surgenor Hyundai in no way condones unsafe or illegal driving practices. All situations mentioned here assume fictional representations of closed roads without drivers and pedestrians. Always practice safe driving and obey posted traffic laws. Let's start with something easy. You're late for a tour of a brand new exhibit at the Canadian Museum of History, and you need to get there ASAP. Your best route from Surgenor, which totals 6.5 kilometres, starts with a straight shot down McArthur Avenue for 1.7 km. Since we have to reach 100kph, we'll call it 1 km, which we'll cover in about 36 seconds. Our next stretch takes us a turn through Vanier Parkway, but you're already cruising and cover the 1.5 km in 54 seconds. A left onto St. Patrick takes you over the Alexandra Bridge and into Quebec. You'll be at your next turn onto Rue Laurier in a minute and 17 seconds, at which point you'll have to brake, of course, before turning onto Rue Papineau. And there you are, ready for your tour. Google Maps claims it'll take you 12 minutes to get from A to B. But in our Genesis fantasy Ottawa, it only took you just over 2 minutes. How's that for fast? Bonus: Could the Genesis Coupe jump the Rideau Canal? The Rideau Canal is just 7.9 meters wide. If our Genesis starts 700 meters back to ensure we hit 100 kph and launch from a 20-degree ramp, we should fly about 48 meters before we make landing again. Of course, we'll likely hit a building before that. Why don't we get out of the city and take a day to explore the Greenbelt? You know by now what the Genesis' 348 horses can do. But what about one single real-life horse? We'll take a quick trip to the Capital Warmbloods ranch outside Ottawa for a day of equine revelry. The problem is, when you called ahead, they said they had a single horse left for today's ride. Better get a move on. You know the drill. Hop in your Genesis and stomp that pedal. We'll stay at 100 kph until we hit the Trans Canada Highway because we have a few high-speed turns until then. Barring deceleration through turns (because this math is shaky at best) we'll hit 100 kph in the middle of Cummings Avenue just before our entrance ramp. All in all, we're on our entrance ramp in about 42 seconds, and it's time to kick things into high gear. We'll reach our exit in just 2 minutes 24 seconds, at which point we need to slow down again. From here, it's just 3 more minutes until we reach Capital Warmbloods. Slam the brakes and roll in quietly; you wouldn't want to startle the last horse. Where Google Maps claims it takes 15 minutes to get to the Greenbelt, our traffic-free, empty world scenario gets us there in our Genesis in just over three and a half minutes. Bonus: What If You Wanted to Return to Surgenor Hyundai on Horseback? You've been speeding between Gatineau and Ottawa all day. It's time to take it easy with your new equine friend. You average horse canters between 19-24 kph. A leisurely canter from the Greenbelt to our dealership would take you 47 minutes 26 seconds. Have you ever needed real speed to get somewhere? 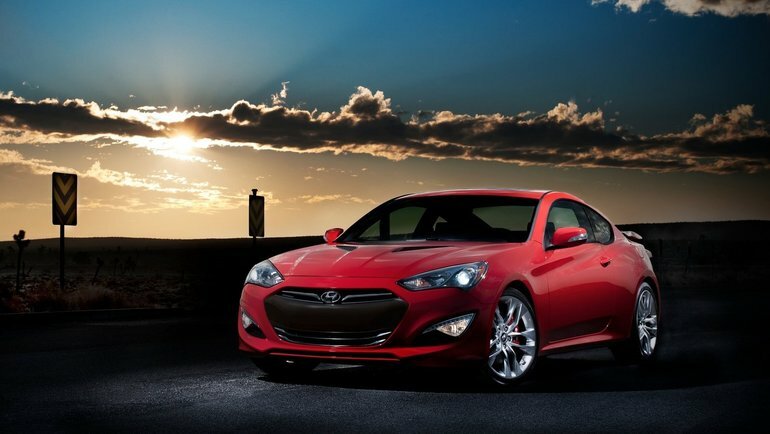 Tell us where you were going and we'll tell you how quickly a Hyundai Genesis Coupe could get you there!